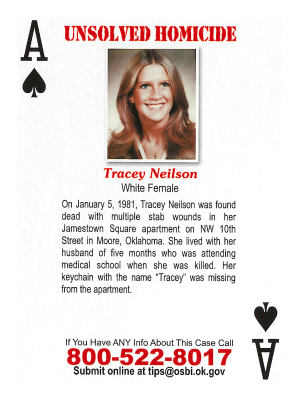 On January 5, 1981, Tracey Neilson was found dead with multiple stab wounds in her Jamestown Square apartment on NW 10th Street in Moore, Oklahoma. She lived with her husband of five months who was attending medical school when she was killed. Her keychain with the name "Tracey" was missing from the apartment.